Abstract. An important share of paleoclimatic information is buried within the lowermost layers of deep ice cores. Because improving our records further back in time is one of the main challenges in the near future, it is essential to judge how deep these records remain unaltered, since the proximity of the bedrock is likely to interfere both with the recorded temporal sequence and the ice properties. In this paper, we present a multiparametric study (δD-δ18Oice, δ18Oatm, total air content, CO2, CH4, N2O, dust, high-resolution chemistry, ice texture) of the bottom 60 m of the EPICA (European Project for Ice Coring in Antarctica) Dome C ice core from central Antarctica. These bottom layers were subdivided into two distinct facies: the lower 12 m showing visible solid inclusions (basal dispersed ice facies) and the upper 48 m, which we will refer to as the "basal clean ice facies". Some of the data are consistent with a pristine paleoclimatic signal, others show clear anomalies. It is demonstrated that neither large-scale bottom refreezing of subglacial water, nor mixing (be it internal or with a local basal end term from a previous/initial ice sheet configuration) can explain the observed bottom-ice properties. We focus on the high-resolution chemical profiles and on the available remote sensing data on the subglacial topography of the site to propose a mechanism by which relative stretching of the bottom-ice sheet layers is made possible, due to the progressively confining effect of subglacial valley sides. This stress field change, combined with bottom-ice temperature close to the pressure melting point, induces accelerated migration recrystallization, which results in spatial chemical sorting of the impurities, depending on their state (dissolved vs. solid) and if they are involved or not in salt formation. This chemical sorting effect is responsible for the progressive build-up of the visible solid aggregates that therefore mainly originate "from within", and not from incorporation processes of debris from the ice sheet's substrate. We further discuss how the proposed mechanism is compatible with the other ice properties described. 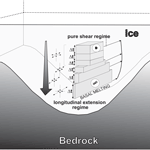 We conclude that the paleoclimatic signal is only marginally affected in terms of global ice properties at the bottom of EPICA Dome C, but that the timescale was considerably distorted by mechanical stretching of MIS20 due to the increasing influence of the subglacial topography, a process that might have started well above the bottom ice. A clear paleoclimatic signal can therefore not be inferred from the deeper part of the EPICA Dome C ice core. 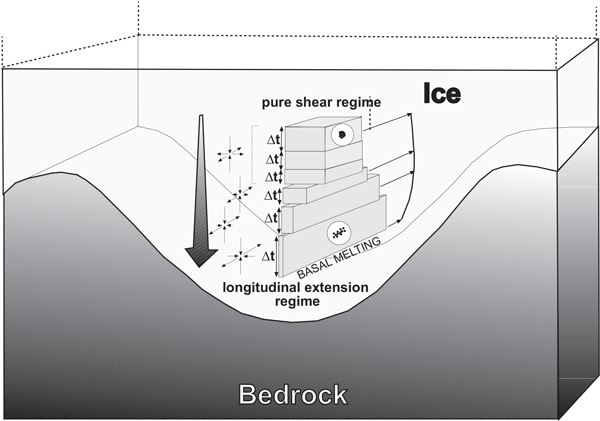 Our work suggests that the existence of a flat monotonic ice–bedrock interface, extending for several times the ice thickness, would be a crucial factor in choosing a future "oldest ice" drilling location in Antarctica. How to cite: Tison, J.-L., de Angelis, M., Littot, G., Wolff, E., Fischer, H., Hansson, M., Bigler, M., Udisti, R., Wegner, A., Jouzel, J., Stenni, B., Johnsen, S., Masson-Delmotte, V., Landais, A., Lipenkov, V., Loulergue, L., Barnola, J.-M., Petit, J.-R., Delmonte, B., Dreyfus, G., Dahl-Jensen, D., Durand, G., Bereiter, B., Schilt, A., Spahni, R., Pol, K., Lorrain, R., Souchez, R., and Samyn, D.: Retrieving the paleoclimatic signal from the deeper part of the EPICA Dome C ice core, The Cryosphere, 9, 1633-1648, https://doi.org/10.5194/tc-9-1633-2015, 2015. The oldest paleoclimatic information is buried within the lowermost layers of deep ice cores. It is therefore essential to judge how deep these records remain unaltered. We study the bottom 60 meters of the EPICA Dome C ice core from central Antarctica to show that the paleoclimatic signal is only affected at the small scale (decimeters) in terms of some of the global ice properties. However our data suggest that the time scale has been considerably distorted by mechanical stretching.